Kenya's diverse areas range from highlands over low plains to sandy beaches on the coast of the Indian Ocean. The Great Rift Valley is home to Africa's biggest fresh water lake - Lake Victoria. The plateaus boast the highest point in the country: Mount Kenya. There's the opportunity of witnessing one of nature's natural wonders the Great Migration of wildebeest and zebra and the chance of seeing the Big Five. You can visit the bustling city of Nairobi, go snorkelling on coral reefs or visit a traditional Maasai village - the opportunities are endless in Kenya. 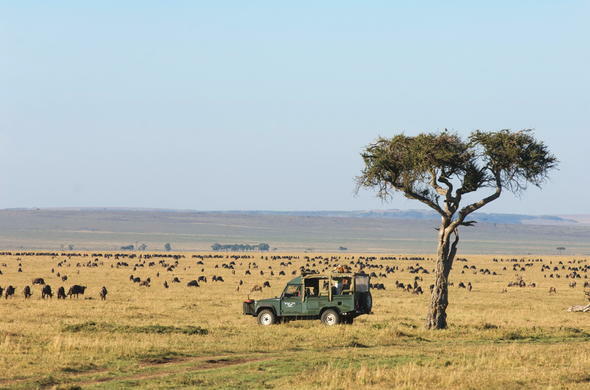 The Masai Mara National Reserve is the most popular, and most famous, game park in Kenya. It is located close to the Tanzanian border, in the north-western corner of Kenya. The biggest attraction is the incredible migration of millions of wildebeest and antelope which happens every year, a huge highlight in many a visitors holiday. The open grasslands support a huge amount of wildlife, rich in its diversity. Guests can also experience the Maasai culture on a visit to a Masai village where interaction with the villagers is a highlight. Hand-crafts such as beadwork can be purchased at the villagers. This is a popular area due to the fantastic views of Mount Kilimanjaro from Amboseli National Park - the world's tallest freestanding mountain is actually in Tanzania but the best view of the mountain is from Amboseli. The landscapes in this area are dry and dusty and the vegetation is sparse, which is great for game viewing, it is even possible to spot the rare Black Rhino. A good place to stop off and purchase Maasai hand-craft is along the road in Namanga, a border town at the foot of Black Mountain or Oi-Doinyo Ook which is sacred to the Maasai people. In the shadow of Mount Kenya (Africas 2nd highest mountain), is the famous Mount Kenya National Park, and the reserves of Samburu, Buffalo Springs and Shaba. The landscapes in the reserves differ greatly from that of Mount Kenya National Park, although they are not far away, here visitors will see savannah plains and desert scrub-land. On the road to Nanyuki there is a large signpost giving the position of the Equator, a great photographic opportunity to move back and forth between the northern and southern hemisphere!. Once a haven for vast herds of game the park, made up of Tsavo West and Tsavo East, went through a time of mass die-out of game. Today however the park harks back to the heydays with large herds of animals including elephant and buffalo to be seen. Other attractions in the vicinity include exploring Lake Jipe in a motorboat or a hand-made dugout canoe. For something different there is swimming in Lake Chala with pygmy crocodiles, Taveta makes a good base for this. Visitors can explore the Lava Flows at Chaimu and Setani or stop off at Makindu to view the Sikh temple and Makindu Handicrafts Co-op. This is a fascinating pre-historic place in the north of Kenya that is characterised by extinct volcanoes, bare terrain and the dark green waters of Lake Turkana. Many ancient fossils have been discovered here and also in this area is the striking sight of the lush South Horr canyon. Over in the east, visitors will find one of the most remote and off the beaten track Parks, Marsabit National Park. For those who are interested in game fishing for tiger fish and Nile perch, Fergusons Gulf is the place to be, where huge crocodiles and abundant birdlife can also be found. The Rift Valley stretches from the Dead Sea in the Middle East, passing through the Red Sea, down into Ethiopia, Kenya, Tanzania, Malawi and finally into Mozambique. Within the rift, which is 6 000km (3 728 miles) long, there are a number of freshwater lakes including Turkana, Naivasha and Baringo as well as a number of soda lakes with a high salt content. The soda lakes including Lake Naivasha and Lake Nakuru are especially loved by great numbers of Flamingos which feed on the nutritious algae and the millions of minute crustaceans that thrive in the lakes. Massive geological upheavals created the Rift Valley and created the volcanic mountains of Longonot and Mt Kenya. This spectacular valley can be approached by rail or road from Nairobi; both afford stunning views from the highlands as the valley snakes away into the distance. This area contains the largest slice of Kenya's population; its rolling tea plantations and gently sloping countryside is scenically attractive and free from mass tourism. The freshwater Lake is the largest feature, measuring 70 000 square km, the 2nd biggest in the world. Kenya, Tanzania and Uganda all share the Lake, however is not possible to travel between the countries today via the water. The Lake is not very deep but is very polluted and bilharzia is common - so visitors should avoid swimming in the lake or walk barefoot through the grass along the shoreline. The local Luo people, originally from Sudan, settled around the Lake in the middle of last century and are now the 3rd largest ethnic group in Kenya. The bustling capital city of Kenya is lively mix of many cultures and people, with some families originating from the earlier settlers of the colonial era, when being able to own a farm in Africa attracted adventurers from far and wide. Many settled in the suburbs of Ngong Hills and Karen. It is most unusual to find a National Park, with a large number of wild animals against a background of high-rise buildings and city life - Nairobi National Park is a sanctuary for Rhino, Lion, Zebra and large herds of antelope. The city is now a bit neglected and the roads need attention, visitors would be wise to keep their wits about them to avoid any sort of robbery whilst in the city. This is another stretch of coastline with delightful beaches, resorts and enjoyable things to do. The town of Mombasa has a long history going back to the 12th century; visitors can experience many cultures and vibrant entertainment and enjoy the interesting architecture. One of the beautiful nature reserves is Shimba Hills National Reserve, set in attractive forest surroundings where game such as Elephant, Leopard and Sable antelope (which is rare) can be seen. South of Mombasa are stunning white sandy beaches and resort hotels where delightful coral reefs can be explored while snorkelling or scuba diving. In the north is Kilifi, a cosmopolitan town of artists and international travellers as well as a number of beaches worth visiting including Kikambala, Vipingo, Nyali, Bambui and Shanzi.